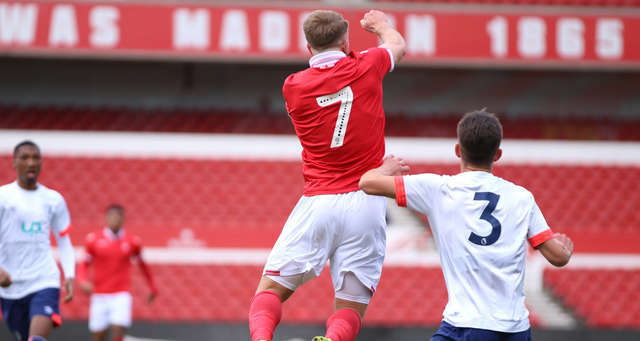 AFC Bournemouth under-21s' Premier League Cup run came to a cruel end as they were narrowly beaten by Nottingham Forest 2-1 at the City Ground. Forest were unbeaten in their group and fielded a team with more than 500 Football League appearances, including the likes of Northern Ireland and Scotland internationals Jamie Ward and Liam Bridcutt. In contrast, Shaun Cooper's side started with seven players from Alan Connell's under-18s team, but the vast difference in experience wasn't clear in the first period. The first real chance for either side came from a sensational James Boote strike ten minutes in. After Tyrell Hamilton was fouled 30 yards out, Boote stepped up to take the central free-kick and smashed a superb strike which swerved and dipped straight against the crossbar to safety. The Cherries continued their attacking thrust and both Gavin Kilkenny and Jaidon Anthony hit chances narrowly over the bar in good areas after some superb build-up play. Forest were then unfortunate not to go ahead when Kieran Hayes had a shot blocked in the area by his own man Yassine En-Neyah, but he did score the opening goal of the game in the 44th minute when he nodded in a free-kick at the near post. As the clock ticked into first-half stoppage time, the Cherries conceded a cruel second. Calum Ward made a brilliant save to keep out an effort from point-blank range, but the rebound unfortunately fell to the experienced Ward who was able to bundle the ball in. The two goals completely changed the momentum of the game, with the Cherries on the back foot for large parts of the second half. Ward made a superb save to keep out Arvin Appiah's fierce volley from close range on the hour, the pick of his stops during a terrific performance. He was also forced to parry Ward’s low effort with 20 minutes to go, a shot which had looked destined for the bottom corner. And those saves eventually gave the Cherries a platform to get back into the game with ten minutes to go. Skipper Kilkenny whipped in an excellent cross with pace from a free-kick and Scotland under-18 international Brennan Camp reacted smartly at the near post to flick the ball into the corner of the net. That gave Cooper's side huge confidence heading into the crucial final ten minutes and substitute Jake Cope went within an inch of securing a leveller. With the hosts under immense pressure, Cope turned and curled a majestic effort from 25 yards which fizzed just wide of the right-hand post. That was the last action as a young Cherries side did themselves proud against a strong Forest side who progress to the quarter-finals of the Premier League Cup. Manager Shaun Cooper said: "The lads tried to implement our gameplan and things we'd worked on in training and in patches we did it well. "It's a great stadium to come to with lots of history, the lads were looking forward to playing here and the competition as a whole has been a good experience. "We've had different players and different teams in each game in the Premier League Cup, and it's pleasing to see the club's identity retained no matter what personnel. "It's a testament to the club's philosophy itself and to Alan Connell who has got the players ready to step up. They may not be as physically strong as their opponents but they've done things the right way and that's pleasing."